How did you first learn about post-graduate service? I had heard of people doing post-graduate service throughout my time as an undergrad and thought about the possibility, but it wasn’t until I participated in a study abroad program in Australia my junior that I really committed to it as something that I wanted to do. During my time abroad, I went on a retreat and felt God calling me to take a break from my studies for a year and just focus on service. When I returned from my study abroad program my senior year, I heard about the Catholic Volunteer Network through the Vanderbilt campus ministry and started exploring different options. 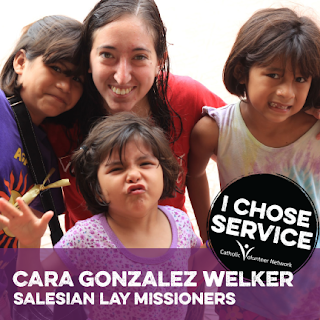 What other options were available to you, and why did you decide on Salesian Lay Missioners? I was applying to graduate schools and service programs my senior year because I didn’t know if I would be able to defer the graduate programs and wanted to have a backup plan in case I didn’t find a service program right for me. After interviewing at a few different schools, I decided that I would be going to the Stanford for my PhD studies. Meanwhile, I had also found a few different programs on the Catholic Volunteer Network that met my requirements of being a year-long, having options to go to a Spanish-speaking site in South or Central America, and ideally having funds to help me get to and from my mission site. After getting rejected from the first mission program that I applied to, I went on an interview with the Salesian Lay Missioners and was accepted. Luckily Stanford let me defer my acceptance for a year to go do mission work, and because I liked what I had learned about the SLMs during the interview, I decided to stick with them! Tell us about your service experience. My site was an orphanage of about 130 girls from the ages of 2 to 22 in the town of Montero, Bolivia (about an hour outside the major city of Santa Cruz). There were five of us volunteers at the site, three from my program and two from a German volunteer program. We all lived on site at the orphanage and had jobs that we decided on within the first few weeks of arriving. I was responsible for the library at the orphanage, which involved keeping all the books organized, helping the older girls with their homework, and planning and maintaining supplies for different activities. I also managed the sponsorship program, which meant finding a sponsor or “godparent” for each girl, collecting dues from the sponsors and using these to buy supplies to make sure that each girl could receive a birthday present on their birthday, picking up packages for the girls from their sponsors, and translating letters from the sponsors to the girls or vice versa. And of course, aside from our assigned jobs, an unspoken “job” for all of us was to just get to know the girls, and to love and support them. What benefits have you gained from this experience that you might not have received otherwise? I’m grateful that I was able to do a year of service between undergrad and graduate school and think that this opportunity gave me many benefits. First of all, the spiritual development that I received through the Salesian Lay Missioners was definitely unique. During our orientation, we were given the opportunity to live in community with the Salesian priests and brothers, and were able to go to daily mass and pray Liturgy of the Hours with them. The atmosphere was slightly different on-site because we were more integrated with the community of permanent employees at the orphanage than the community of sisters, and going to daily mass every day was difficult because of responsibilities with the girls. However, I did have more time for spiritual reading and obviously interacted a lot with the sisters that ran the orphanage, which was a fairly unique opportunity for my spiritual development. Another reason that I wanted to go to a Spanish-speaking site was to improve my Spanish. My mom comes from a Mexican heritage and always encouraged me and my sister to learn Spanish because she regretted never learning Spanish growing up. I did take classes in high school and ended up minoring in Spanish, but you can only learn so much through classes. Living in a town where I only met one person who was not a volunteer and spoke English definitely helped me improve my Spanish! I think learning not only a different language, but also a different culture from what you are accustomed to is extremely valuable. Although there were plenty of things that frustrated me about the Bolivia culture, like their education system and how nothing ever started on time, there were also many beautiful things, like how the people there consistently took the time to listen to one another because they put people ahead of work. Finally, my year of service allowed me to take a step back from the academic life and affirm my decision to pursue a graduate degree and hopefully become a professor someday. I did enjoy my time at the orphanage a lot, but spending a year away from university level academics allowed me to miss classes and research. I also think the experience tutoring the older girls has been and will continue to be helpful to helpful as I learn more about teaching, especially teaching different types of students. When I was applying to graduate schools and service programs, I talked with multiple people in admissions from various graduate programs who told me I was crazy for taking a year away from my studies to do something fairly unrelated, and that it would not look good on a resume or application in the future. But I would say that the experience didn’t negatively affect my career trajectory and has even helped me in academia, as I recently received a fairly competitive fellowship with one reviewer’s comments saying that my experience being bilingual and having international experience was something on my application that stood out. What advice do you have for someone considering post-graduate service? I’ll admit that it’s not for everyone, but if what’s holding you back is being worried about delaying your career trajectory or worrying that your colleagues will judge you for not following a more conventional path, don’t let that stop you! You learn so much about yourself and about the world doing a year of service and you will most likely be glad that you took the time to do it when you had the opportunity.